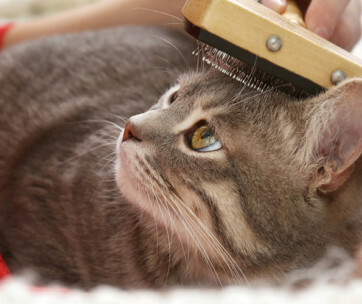 If you haven’t given your cat to the groomers or if you haven’t given them a bath in a while, you may notice a bit of discharge coming out of your cat’s eyes. This usually unknown substance may even cause irritation, which could lead to your pet pawing at or scratching its eyes on a rough surface. While this may provide temporary relief, the best way to prevent this from happening is to give the eyes a thorough cleaning. It would be best to do this as soon as you notice something gooey coming out of your cat’s eyes. If your cat is healthy, its eyes should be as bright and clear as day. Before we discuss how to properly clean a feline’s eyes, let’s begin by discussing the possible causes for this discharge. There are a few common reasons to explain why this happens. The first of them is feline upper respiratory infection, which is caused by viruses, bacteria, or other medical conditions. The symptoms of this can be very mild, or they can progress to something more serious if they’re left unattended. One of the symptoms of a feline upper respiratory infection is a sticky, pus-like discharge coming from a cat’s eyes. This is why you should always consult with a veterinarian. Corneal disorders can also be a cause of unwanted eye discharge in cats. For those who don’t know, the cornea is the dome-shaped surface in the front part of a cat’s eye. In some cats, the cornea can be inflamed or ulcerated. Symptoms of this include cloudy vision, excessive blinking, and teary eyes. Uveitis can also cause inflammation in a cat’s eyes. Other conditions that may cause eye discharge include, but are not limited to feline infectious peritonitis, allergies, or having something lodged in the eye. Another reason for eye discharge in cats is conjunctivitis. This could come in the form of pink eye or dry eye (keraconjunctivitis sicca). Pink eye is described as an inflammation of the pink lining around your cat’s eye. This causes them to be sensitive to light and to look swollen. Aside from swelling and sensitivity, another symptom of pink eye is a clear, thick discharge coming from the eyes of a cat. On the other hand, dry eye is connected to a lack of tear production in cats. This can lead to inflammation of the cornea, redness of the eyes, as well as a yellow discharge coming from the eyes. In some cases, this could potentially lead to blindness. Epiphora is another eye condition associated with tear production. More specifically, this is caused by a blockage in the tear ducts. There are also cat breeds that just naturally have fluid discharge coming out of their eyes. The most common breeds that have this are Persians as well as exotic long and short hair cats – flat-faced cats in general. However, if you notice any of these symptoms, bring your cat to the vet as soon as possible. They’ll provide the appropriate medication and schedule surgery, if advised. Now that we’ve talked about what can cause a cat’s eyes to have discharge, we can now talk about how to clean it in a safe manner. The first way to do this is to use warm water and cotton balls. Be sure to use sterilized water for this method, as you want this process to be as clean as possible. Begin by bringing an appropriate amount of water up to a boil. Afterwards, let the water cool to room temperature. Make sure that the water you use to clean your cat’s eyes isn’t too hot, as this may hurt your cat and cause further damage. You can also transfer the lukewarm water into different containers for easier access. Dip the cotton balls in the water. If you don’t have access to clean cotton balls, you could make do with a clean cloth or wash towel. Just make sure that what you use is soft in order to avoid further irritation. Once you’ve dampened your cotton balls, the best way to position your cat is to have them sit on your lap, facing away from you. You could also hold your cat under their chin to make sure they sit still during the whole ordeal. You could even ask someone to assist you in keeping your cat still. This not only places them within your reach for easier cleaning, but it also gives them a sense of comfort or safety. Once you’ve gotten your cat settled down, it’s time to wipe off the fluid coming out of your cat’s eyes. Use your dominant hand to wipe off the gunk. Meanwhile, you can use your less dominant hand to pet your cat, or to prepare other materials. When wiping, make sure that none of the gunk gets into either of your cat’s eyes. 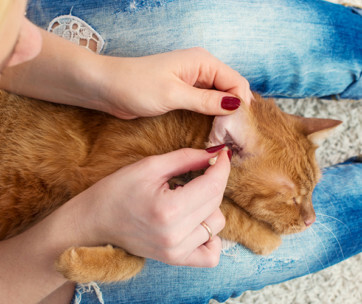 Be careful not to poke your cat’s eye with your finger, especially if you have long nails. You should also ensure that you use a different cotton ball per eye. Using the same piece of cotton may lead to an infection. Another way you could clean your pet’s eyes is by using tea bags. Start off by steeping a couple of black or green tea bags in some hot water. Make sure you use the plain variety, as any additive may be a cause for infection. Try using organic tea if you can as well. These types of tea contain antibacterial properties that help soothe irritated eyes. After letting the tea bags steep for around three to four minutes, place them on a clean paper towel to absorb excess liquid and to allow them cool down. The next step in this process is to have your cat sit completely still. Placing your cat in a comfortable position will help it keep still for a couple of minutes while the room temperature tea bags are on its eyes. You can sit them on your lap and wrap a towel around them. Slowly adjust how the towel is wrapped around your pet until only its eyes are exposed. Having a person to assist you would be really helpful in this scenario, as they can hold the cat still while you hold the tea bags, or vice versa. Once your cat is still, press the cooled tea bags against your cat’s eyes for one or two minutes. This will help loosen layers of crust that have formed on the eyes making them easier to wipe off. Try to get as little tea into your cat’s eye as possible, as this may cause a bit of discomfort for your pet. Once the two minutes is up, remove any remaining discharge using a clean cotton ball or towel dipped in some warm water. If neither of these more do-it-yourself options work, you could always buy products specifically made for cleaning a feline’s eyes. These are available in pet stores or in veterinary clinics. Depending on whether or not your cat has an eye infection, different treatment options maybe recommended. If your cat has conjunctivitis or a corneal disorder, try to get your hands on an antibiotic ointment. Meanwhile, if your cat’s tear ducts have a blockage, you could use a saline solution to flush it out and return regular function. We’ve now talked about the possible causes of fluid discharge as well as different ways to treat it. But as they say, “prevention is always better than the cure.” The first way you can help prevent gunk from forming in your cat’s eye is to keep up with their yearly vaccinations. This is where having a vaccination record or booklet would be extremely helpful. Having your cat vaccinated prevents the illnesses mentioned in the first part of this article. A complete set of vaccinations may be expensive at the start, but it will save you more money in the long run in vet and medicine fees. Another way you can prevent eye discharge is to avoid overcrowding your pets. If you have many cats at home, try your best to keep them in separate rooms. 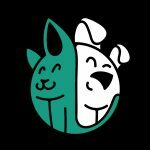 If this isn’t possible, you can keep them in the same room, but in different pet carriers. Just give them a bit of time interact everyday so they won’t get lonely. Also, if you can, check frequently if your cat’s eyes are red, cloudy, or have changed their shape. You could also check if your cat has suddenly become sensitive to light. Immediately explore your treatment options if your pet exhibits any of these. Now we know what causes gunk to form on a cat’s eyes as well as how to prevent and remove it. 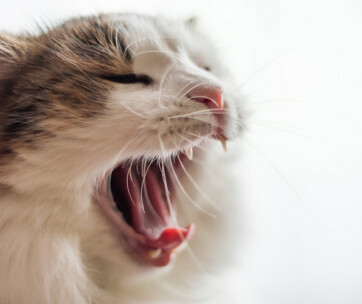 If your cat doesn’t belong to a breed that exhibits frequent fluid eye discharge, check for any of the other symptoms listed here if they begin to. Explore different possibilities for treating eye discharge until you land on something that works best for your beloved cat, so you’ll know what to do if this were to ever happen again.